My friend Nikolai who runs the Technique Assignments on the Digital Grin forums asked me to write up a brief technique discussion of how to light glass bottles. Well, I have always said "everything worth doing is worth overdoing," so over time I plan to turn this post into and expanded discussion on lighting glass. Note that much of the material I am discussing here starts from the book Light, Science and Magic: An Introduction to Photographic Lighting by Fil Hunter, Steven Biver and Paul Fuqua. I am not going to assume you have read this book, but if you are interested in this topic, you should read it. First things first: this is an essay about studio lighting. If you are not used to studio work, be prepared for a change in mindset. You are not capturing a scene, you are creating it. Studio photography means taking full control of everything the camera sees and particularly in the case of glass photography this will require 360 degree control of the space you are shooting in. Generally the way I work is this: the camera goes on a tripod with a cable release and then I set up the camera to frame my working space. Next I set up my background. Then build my scene by placing my subjects in the scene. After that I try to determine the proper aperture and focus point to get my entire scene sharp. Almost always this means using manual focus to pick the focus distance which allows the widest possible aperture; the shutter speed is set to the fastest sync speed the camera allows and the ISO is set to 100. At this point, the camera work is done; the remaining work is done entirely with the lights. In particular, I usually adjust for proper exposure by changing the flash power rather than with settings on the camera; this is always done by chimping the histogram with the flash set in manual mode. I never use any form of auto exposure for studio work and flash meters work extremely poorly for glass and other reflective objects; it is possible to get the exposure right with a spot meter but in this day and age its not worth the effort. In the circumstances where the flash is not powerful enough, to get the exposure I want I will set the flash on full power and bump the ISO for proper exposure. Diffuse reflection is the most common form of light we photograph. It is an idealization, but for many materials a good one; incident light meters are calibrated to it, much of lighting theory is based on it, and we often use circular polarizers eliminate other forms of light. In a nutshell what makes glass challenging it the complete lack of diffuse reflections. Because of that we have to completely rethink our instincts both for exposure and lighting. If your goal is to show the three dimensional form of the glass there are really to major approaches: refraction and reflection. In a nutshell, glass usually behaves both as a mirror and as a lens. Of course flat glass is a rather boring lens and the lenses in your camera are coated to make them poor mirrors. None-the-less, most pieces of glass you are likely to be interested in photographing are like to exhibit both properties to some degree. The true key to lighting glass is to really look at the lens-like and mirror-like properties of your subject and decide how to exploit them to create the image you want. What I mean by Refractive Lighting is lighting the subject in a way that reveals its form because of how the light passing through it is refracted. Curved glass is refractive which means it bends light and distorts any image which passes through it. As the glass gets thicker and more curved this effect gets stronger. The general strategy for using refraction to show the form of glass is to light the glass from behind with a high contrast pattern. The most common approaches for mildly refractive subjects are either to use a white backdrop with a black border or a black backdrop with a white border. In either case the border is placed just outside the camera's direct view so that is is only visible via refraction in the glass subject. With some highly refractive objects (like dewdrops and full wine glasses) it possible to actually use the subject as a lens to reveal a secondary subject in the background. By Reflective Lighting I mean revealing the form of the subject through specular reflection off of its surface. Glass usually has a polished surface which makes it reflective. It is possible then to show the form of the glass in how it reflects its environment. If the glass is clear, it is best to make sure that the background is black so that the transmitted light doesn't compete with the reflections. Specular reflections from point light sources are very bright and will blow out so you should use large diffuse light sources. If you don't have a soft box use either a bounce card or a white diffuser sheet. Umbrellas aren't a good choice for reflective subjects because the ribs will show. There are many other ways to light specific glass subjects. For instance tinted subjects can reveal form through density and dirty, impure or frosted glass can reveal form through scattered light. However, for this article we are going to stick to just two, reflection and refraction, because they are quite commonly useful for solving some difficult lighting problems. Before you start lighting your subject, it is best to decide up front whether you are going to use reflection or refraction for your lighting strategy. Generally, if the subject highly refractive (i.e. behaving like a fish eye lens it is best to use a white field refractive approach (with white directly behind the subject and black outside the camera's field of view) because otherwise you will have a hard time controlling reflections off the subject. If the subject is not refractive enough you may have to put your border too close to your subject to get the framing you would like which would indicate using a reflective strategy. If your subject is darkly tinted or translucent in a way that will obscure light transmission you should again choose reflection. While many subjects will force your hand to pick one strategy or the other, there are also some subjects where either will work and the choice is personal taste. Now for a few samples just to get you thinking about it. 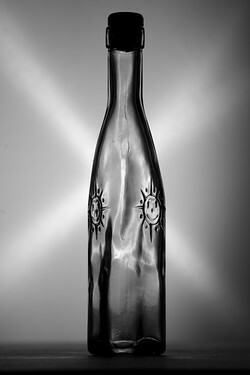 Empty bottles typically bend the light passing through their edges enough that you can create an outline around the bottle using refractive light. The effect gives you a two dimensional look as the center of the bottle is not curved enough to pick up the contrasting border. 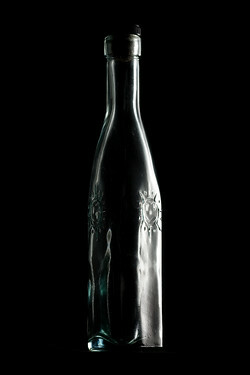 Reflective lighting is possible on a clear empty bottle but it takes extremely careful background control to provide a sufficiently dark background for good contrast. If you want to show the color of the glass, you must shine light through it. With light colored glass it is probably best to use refractive lighting. With dark colored glass it is possible to show the color with a back light and still have sufficient contrast to use reflections to show form. The strong refractions of a full bottle make refractive lighting a better choice here and controlling reflections will put the emphasis on the contents of the bottle. A dark full bottle is similar to a darkly tinted bottle. To show form it is usually best to use reflections. Again a back light can sometimes be used to show the color of the bottle contents. If you are looking for decorate your home or weeding or another party event with the glass bottles because the glass bottles are the very useful product for the purpose of decoration, then always try to use the colored glass bottles, if you do not have colored glass bottles then you can buy these Colored Glass Bottles from here. Canon 5D self timer and mirror lock up.